The early season New England Revolution home games at Gillette Stadium are often scheduled to kickoff in the afternoon instead of the evening. Presumably, this is in effort to maximize the possibility that the game will be played in temperatures suitable for humans to stand around outside for prolonged periods. In Saturday's case, the three o'clock kickoff did little to help the fact that the wind was whipping wet, sideways snow in my hair and eyeballs. On the plus side, an early kickoff meant that tailgating would start at noon. This seemed like obvious encouragement to serve tailgate brunch. Given the discomfort associated with cold, wet hands and cold, wet ingredients, I didn't want to spend much time actually doing prep work at the tailgate. So I opted for tofu scramble breakfast burritos, which could be prepared entirely ahead of time and quickly heated in tinfoil on the grill. 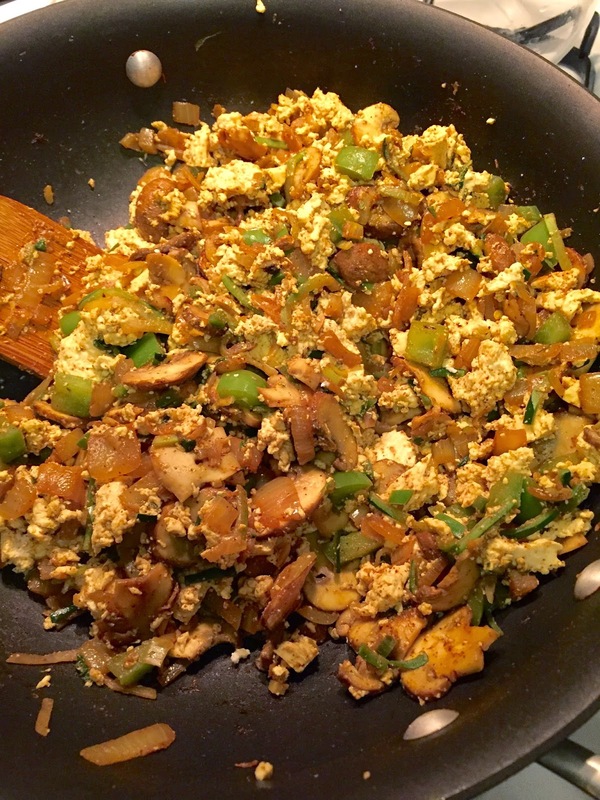 Chris is not a huge "tofu scramble" fan and prefers a good old-fashioned egg scramble, but I happen to really enjoy the taste and texture of a tofu scramble. There are many, many variations of tofu scrambles out there. 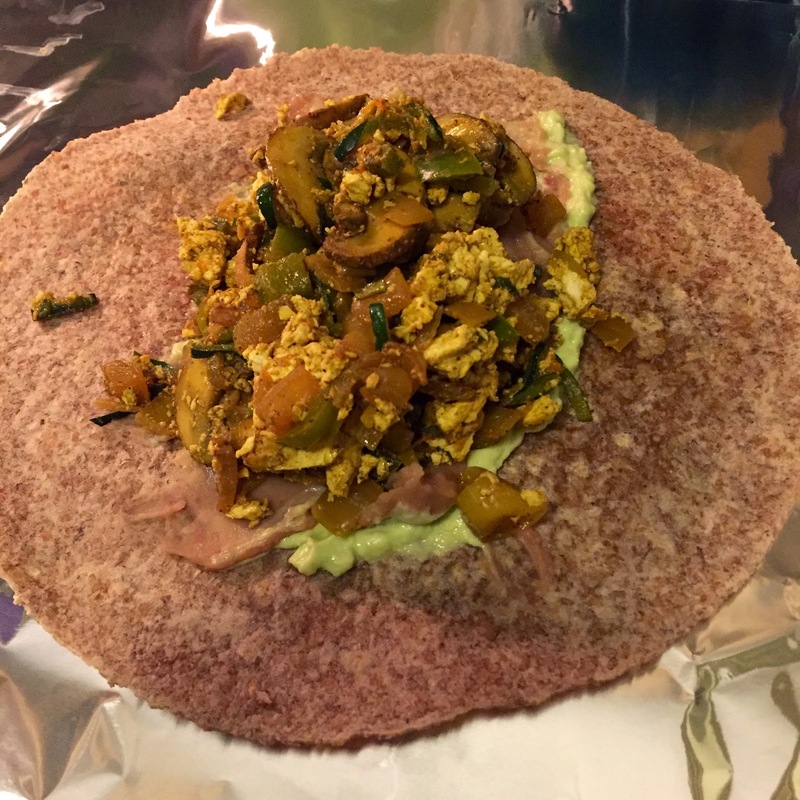 Here's a recipe for my version of breakfast burritos. Drain water from tofu. 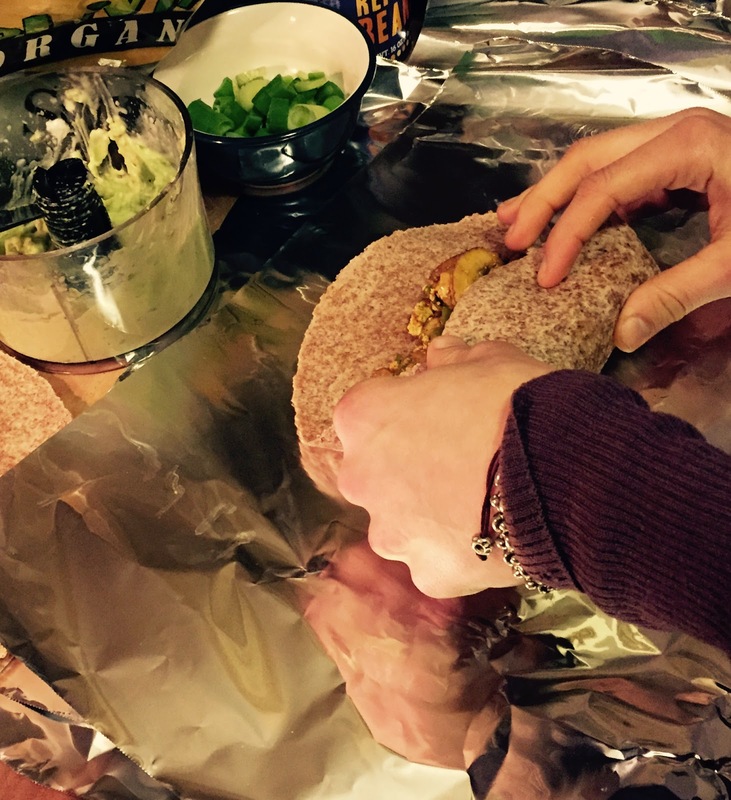 Wrap in a few layers of paper towel and place between two plates. Weigh down top plate with some cookbooks or a heavy skillet to press out excess water for at least 10 minutes. Meanwhile, heat oil in a large skillet over medium heat. Saute onion until translucent, about 3-5 minutes. Add garlic and cook until fragrant (1 minute). Add cumin, turmeric, and smoked paprika, stirring to combine. 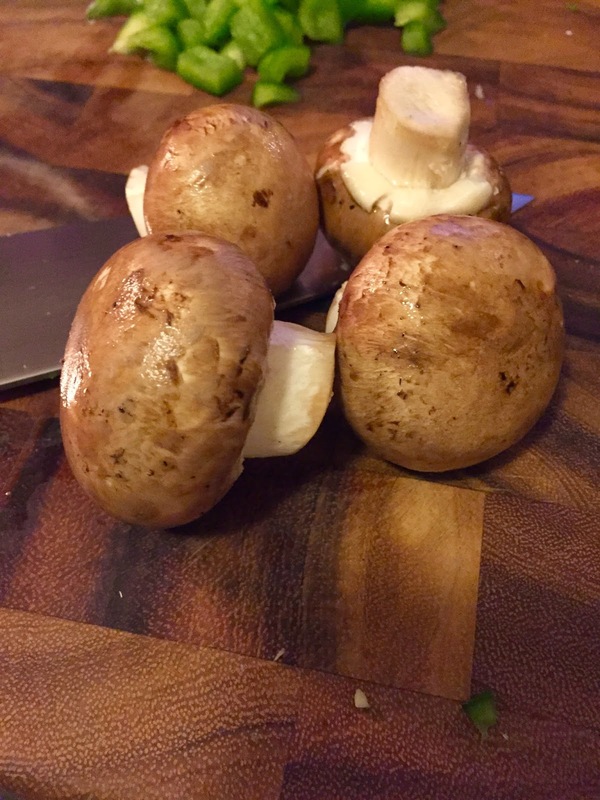 Lower heat slightly and add mushrooms, jalapeno, bell pepper, zucchini. Saute for 5 minutes, stirring occasionally. Using your hands, crumble in tofu. Add nutritional yeast, salt and pepper and stir gently to combine. Saute for an additional 5 minutes, or until heated through. Spread a spoonful of refried beans, a few slices of avocado and a handful of spinach on a tortilla. Top with about 3/4 cup tofu and veggie mixture and top with your favorite burrito toppings. Carefully fold up tortilla. If you're not eating it right away (as in, perhaps you are taking your burrito to eat at a tailgate later), wrap the burrito in tinfoil and refrigerate. When you're ready to go, you can toss it on the grill to heat up quickly. After stuffing my burritos, I had a considerable amount of leftover tofu veggie filling. If you use larger tortillas you may be able to squeeze in some more filling to each burrito...though you should know that the extra filling was delicious eaten straight out of the skillet with a fork and a splash of hot sauce. I served my burritos with grilled sweet potato wedges, which I parboiled for two minutes at home before tossing with some cumin, chili powder, paprika, oregano and garlic powder and packing in a glass container. I was able to drop the wedges directly on the hot grill to get some nice crispy grill marks before serving. We wolfed down our burritos with numb fingers and then hunkered in the car with the heat blasting in attempt to regain sensation before trudging in to the stadium. In what appeared to be an attempt at a cruel joke, the Beach Boys Kokomo was drifting over the PA system as we found our way to our seats. And then: Miracle of miracles! Chris called in a favor, and our ticket rep/hero Kyle showed up with club level tickets. Meaning I got to watch the game from inside a heated room, standing behind a glass wall. I didn't even care that popcorn-smeared, unattended children were crawling around my feet, treating the club like some sort of McDonald's Play Place. And the Revs finally won, by a score of 2-1. Please ignore the sad emptiness of the stadium.